Comacchio - The Art of breeding Eels - A well-designed Eel Farm - Profits of Eel-breeding in the 16th century - Progress of Fishing in Scotland - A Scottish Bus - Newfoundland Fisheries - The Greenland Whale Fishing - Specialty of different Fishing Towns - The General Sea Fisheries of France - French Fish Commerce - French Sea Fisheries - The Basin of Arcachon - French Sardine Fishery - Sardine Curing - Want of Statistics of the British Fisheries. LONG before the organisation of the Dutch fisheries there existed a quaint colony of Italian fisher people on the borders of a more poetic water than the Zuyder Zee. I allude to the eel-breeders of Comacchio on the Adriatic. This particular fishing industry is of very considerable antiquity, as we have well-authenticated statistics of its produce, extending over three centuries. The lagoons of Comacchio afford a curious example of what may be done by design and labour. This place was at one time a great unproductive swamp, about one hundred and forty miles in circumference, accessible to the waves of the sea, where eels, leeches, and other inhabitants of such watery regions, sported about unmolested by the hand of man; and its inhabitants—the descendants of those who first populated its various islands—isolated from the surrounding civilisation, and devoid of ambition, have long been contented with their obscure lot, and have even remained to this day without establishing any direct communication with surrounding countries. The precise date at which the great lagoon of Comacchio was formed into a fish-pond is not known, but so early as the year 1229 the inhabitants of the place—a community of fishers as quaint, superstitious, and peculiar as those of Buckie on the Moray Firth, or any other ancient Scottish fishing port—proclaimed Prince Azzo d’Este Lord of Comacchio; and from the time of this appointment the place grew in prosperity, and its fisheries began to assume an organisation and design which had not before been their characteristic. 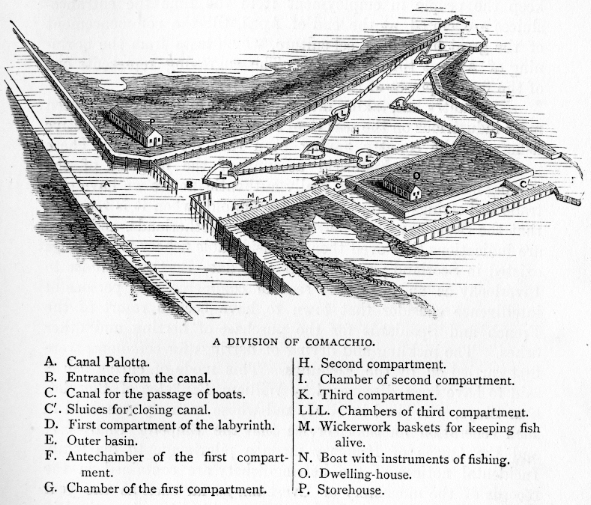 The waters of the lagoon were dyked out from those of the Adriatic, and a series of canals and pools were formed suitable for the requirements of the peculiar fishery carried on at the place, all of which operations were greatly facilitated by the Reno and Volano mouths of the Po forming the side boundaries of the great swamp; and, as a chief feature of the place, the marvellous fish labyrinth celebrated by Tasso still exists. Without being technical, we may state that the principal entrances to the various divisions of the great pond—and it is divided into numerous stations—are from the two rivers. A number of these entrances have been constructed in the natural embankments which dyke out the waters of the lagoon. Bridges have also been built over all these trenches by the munificence of various Popes, and very strong flood-gates, worked by a crank and screw, are attached to each, so as to regulate the migration of the fish and the entrance and exit of the waters. A very minute account of all the varied hydraulic apparatus of Comacchio would only weary the reader; but I may state generally, and I speak on the authority of M. Coste, that these flood-gates place at the service of the fish-cultivators about twenty currents, which allow the salt waters of the lagoon to mingle with the fresh waters of the river. Then, again, the waters of the Adriatic are admitted to the lagoon by means of the Grand Pallota Canal, which extends from the Port of Magnavacca right through the great body of the waters, with branches stretching to the chief fishing stations which dot the surface of this inland sea, so that there are about a hundred mouths always ready to vomit into the lagoon the salt water of the Adriatic. The entire industry of this unique place is founded on a knowledge of the natural history of the particular fish which is so largely cultivated there—viz, the eel. Being migratory, it is admirably adapted for cultivation, and being also very prolific and of tolerably rapid growth, it can be speedily turned into a source of profit. About the end of the sixteenth century we know that the annual income derived from eel-breeding in the lagoons was close upon £12,000—a very large sum of money at that period. animals to fatten upon nothing. However, they go about this in a very economic way, for the same water that grows the fish also grows the food on which they are fed. This is chiefly the aquadelle, a tiny little fish which is contained in the lakes in great numbers, and which, in its turn, finds food in the insect and vegetable world of the lagoons. Other fish are bred as well as the eel—viz, mullet, plaice, etc. On the 2d day of February the year of Comacchio may be said to begin, for at that time the montee commences, when may be seen ascending up the Reno and Volano mouths of the Po from the Adriatic a great series of wisps, apparently composed of threads, but in reality young eels; and as soon as one lot enters, the rest, with a sheeplike instinct, follow their leaders, and hundreds of thousands pass annually from the sea to the waters of the lagoon, which can be so regulated as in places to be either salt or fresh as required. Various operations connected with the working of the fisheries keep the people in employment from the time the entrancesluices are closed, at the end of April, till the commencement of the great harvest of eel-culture, which lasts from the beginning of August till December. The engraving represents one of the fishing-places of the lagoon. No country has, taking into account size and population, been more industrious on the seas than Scotland-the most productive fishery of the country having been that for herring. There is no consecutive historical account of the progress of the herring-fishery. The first really authentic notice we have of a trade in herrings is nine hundred years old, when it is recorded that the Scots exported herrings to the Netherlands, and there are indications that even then a considerable fishery for herrings existed in Scotland; and prior to that date Boethius alludes to Inverlochy as an important seat of commerce, and persons of intelligence consider that town to have been a resort of the French and Spaniards for the purchase of herring and other fishes. The pickling and drying of herrings for commerce were first carried on by the Flemings. This mode of curing fish is said to have been discovered by William Benkelen of Biervlet, near Sluys, who died in 1397, and whose memory was held in such veneration for that service that the Emperor Charles V. and the Queen of Hungary made a pilgrimage to his tomb. Incidental notices of the herring-fishery are contained in the records of the monastery of Evesham, so far back as the year 709, and the tax levied on the capture of herrings is noticed in the annals of the monastery of Barking as herring-silver. The great fishery for herrings at Yarmouth dates from the earliest Anglo-Saxon times, and at so early a period as the reign of Henry I. it paid a tax of 10,000 fish to the king. We are told that the most ancient records of the French herring fishery are not earlier than the year 1020, and we know that in 1088 the Duke of Normandy allowed a fair to be held at Fecamp during the time of this fishery, the right of holding it being granted to the Abbey of the Holy Trinity. The Yarmouth fishery, even in these early times, was a great success-as success was then understood. Edward III, did all he could to encourage the fishery at that place. In 1357 he got his parliament to lay down a body of laws for the better regulation of the fisheries, and the following year sixty lasts of herring were shipped at Portsmouth for the use of his army and fleet in France. In 1635 a patent was granted to Mr. Davis for gauging red-herrings, for which Yarmouth was famed thus early, at a certain price per last ; his duty was, in fact, to denote the quality of the fish by affixing a certain seal ; this, so far as we know, is the first indication of the brand system. His Majesty Charles II., being interested in the fisheries, visited Yarmouth in company with the Duke of York and others of the nobility, when lie was handsomely entertained, and presented with four golden herrings and a chain of considerable value. Several of the kings of Scotland were zealous in aiding the fisheries, but the death of James V., and the subsequent religious and civil commotions, put a stop for a time to the progress of this particular branch of trade, as well as to every other industrial project of his time. In 1602 his successor on the throne, James VI., resumed the plans which had been chalked out by his grandfather. Practical experiments were made in the art of fishing, fishing towns were built in the different parts of the Highlands, and persons well versed in the practice were brought to teach the ignorant natives; but as the Highlanders were jealous of these "interlopers," very slow progress was made; and again the course of improvement was interrupted by the king's accession to the throne of England and the union of the two Crowns. During the remainder of James's reign little progress was made in the art of fishing, and we have to pass over the reign of Charles I., and wait through the troublous times of the Protectorate till we have Charles II, seated on the throne, before much further encouragement is decreed to the fisheries. Charles II, aided the advancement of this industrial pursuit by appointing a Royal Council of Fishery, in order to the establishment of proper laws and regulations for the encouragement of those engaged in this branch of our commerce. After this period the British trade in fish and knowledge of the arts of capture expanded rapidly. It is, said, as I have already stated, that during our early pursuit of the fishery the Dutch learned much from us, and that, in fact, while we were away founding the Greenland whale-fishery, the people of Holland came upon our seas and robbed us of our fish, and so obtained a supremacy in the art that lasted for many years. At any rate, whatever the Dutch accomplished, we were particularly industrious in fishing. Our seas were covered with busses of considerable tonnage-the average being vessels of fifty tons, with a complement of fourteen men and a master. The mode of fishing then was to sail with the ship into the deep sea, and. then, leaving the vessel as a rendezvous, take to the small boats, and fish with them, returning to the large vessel to carry on the cure. The same mode of fishing, with slight modifications, is still pursued at Yarmouth and some other places in England. Much has been written about the great cod-fishery of Newfoundland: it has been the subject of innumerable treatises, Acts of Parliament, and other negotiations, and various travellers have illustrated the natural products and industrial capabilities of the North American seas. The cod-fishery of Newfoundland undoubtedly affords one of the greatest fishing industries the world has ever seen, and has been more or less worked for three hundred and sixty years. Occasionally there is a whisper of the cod grounds of Newfoundland being exhausted, and it would be no wonder if they were, considering the enormous capture of that fish that has constantly been going on during the period indicated, not only by means of various shore fisheries, but by the active American and French crews that are always on the grounds capturing and curing. Since the time when the Red Indian lay over the rocks and transfixed the codfish with his spear, till now, when thousands of ships are spreading their sails in the bays and surrounding seas, taking the fish with ingenious instruments of capture, myriads upon myriads of valuable cod have been taken from the waters, although to the ordinary eye the supply seems as abundant as it was a century ago. When my readers learn that the great bank from whence is obtained the chief supply of codfish is nearly six hundred miles long and over two hundred miles in breadth, it will afford a slight index to the vast total of our sea wealth, and to the enormous numbers of the finny population of this part of our seas, the population of which, before it was discovered, must have been growing and gathering for centuries ; but when it is further stated-and this by way of index to the extent of this great food-wealth-that Catholic countries alone give something like half a million sterling every year for the produce of these North American seas, the enormous money value of a well-regulated fishery must become apparent even to the most superficial observer of facts and figures. It is much to be regretted that we are not in possession of reliable annual statistics of the fisheries of Newfoundland, but there are so many conflicting interests connected with these fisheries as to render it difficult to obtain accurate statistics. It is pleasant to think that the seas of Britain are at the present time crowded with many thousand boats, all gleaning wealth from the bosom of the waters. As one particular branch of sea industry becomes exhausted for the season, another one begins. In spring we have our white fisheries; in summer we have our mackerel; in autumn we have the great herring-fishery; then in winter we deal in pilchards and sprats and oysters; and all the year round we trawl for flat fish or set pots for lobsters, or do some other work of the fishing in fact, we are continually, day by day, despoiling the waters of their food treasures. When we exhaust the inshore fisheries we proceed straightway to the deep waters. Hale and strong fishermen sail hundreds of miles to the white-fishing grounds, whilst old men potter about the shore, setting nets with which to catch crabs, or ploughing the sand for prawns. At different places we can note the specialties of the British fisheries. In Caithness-shire we can follow the greatest herring-fleet in the world ; at Cornwall, again, we can view the pilchard-fishery; at Barking we can see the cod-fleet; at Hull there is a wealth of trawlers ; at Whitstable we can make acquaintance with the oyster-dredgers; and at the quaint fishing-ports on the Moray Firth, we can witness the manufacture of "Finnan haddies," as at Yarmouth we can take part in the making of bloaters ; and all round our coasts we can see women and children industriously gathering shell-fish for bait, or performing other functions connected with the industry of the sea-repairing nets, baiting the lines, or hawking the fish, for fisherwomen are true helpmates to their husbands. At certain seasons everything that can float in the water is called into requisition-little cobles, gigantic yawls, trig schooners, are all required to aid in the gathering of the sea harvest. Thousands of people are employed in this great industry; betokening that a vast population have chosen to seek bread on the bosom of the great deep. Crossing the Channel, we may note that the general sea fisheries of France are also being prosecuted with great vigour, and at those places which have railways to bear away the produce with considerable profit. All kinds of fish are caught on the French coasts with much assiduity, and the coast-line of that country being enormous-in length, reaching from Dunkirk to Bayonne, including sinuosities, it will be considerably over 2000 kilometres - there is a great abundance of fish, the only regret in connection with the food fisheries being that at those places where the yield could be best obtained the fishing is but lazily prosecuted, in consequence of the want of inland conveyance. From many of the fishing villages there is no path to the populous inland cities, and the fish is sold, as it used to be sold in Scotland before the days of railways and other quick conveyances, by the wives of the fishermen, who hawk the produce of the sea through the country. In such towns as Boulogne, where there is a large resident population, and a constant accession of English visitors as well, the demand for fish is constant and considerable, and well supplied. In the department of the Pas de Calais there are over 600 fishing-boats. In Boulogne harbour, which is the chief port of the district, the English visitors will see a large number of boats, chiefly trawls, and all who visit Boulogne have seen the fishwives, if not dressed en fete, then in their work-a-day habits, doing hard labour for their husbands or the tourists. Sea fish is scarce and dear over most of inland France ; the prices in the market at Paris rule very high for premier qualities, but in that gay capital there is apparently no scarcity. Fish must be had, and fish can always be obtained, whenever there is money to pay the price demanded. In fact, a glance at the fish department of the grand marche would lead one to suppose that, next to growing fruit and vegetables, catching fish was the great industry of the country. The modes of sea-fishing are so much alike in every country that it is unnecessary to do more than just mention that the French method of trawling is very similar to our own. But there are details of fishing industry connected with that pursuit on the French coasts that we are not familiar with in Britain. The neighbouring peasantry, for instance, come to the seaside and fish with nets which are called bas parc; and these are spread out before the tide is full, in order to retain all the fish which are brought within their meshes. The children of these land-fishers also work, although with smaller nets, at these foreshore fisheries, while the wives poke about the sand for shrimps and the smaller crustacea. These people thus not only ensure a supply of food for themselves during winter, but also contrive during summer to take as much fish as brings them in a little store of money. By far the best place to study the economy of the French fisheries is at the basin of Arcachon, 34 miles from Bordeaux. There may be seen the small boat as well as the trawl fishery ; and, above all, in the placid waters of the basin may be seen the model oyster-beds of France-beds that rarely languish for lack of spat, which has seldom been known to fail ; beds which produce a nice, fat, tasteful oyster, placed in an inland sea that is prolific of many of the best food fishes, and contains the finest grey mullet in the world. To those who are anxious thoroughly to study the French mode of fishing, Arcachon has this advantage, that it has a day as well as a night fishery, and is also one of the most unique bathing-places in the whole of France. From the balconies of one's hotel, or from the windows of the houses, the whole industry of the basin may be observed daily and nightly ; but the best plan for seeing a fishery is to take a part in it, to sail out in the boats, and handle the trawl or other nets. The chief fishing quarter is at the extreme east end of Arcachon, consisting of a cluster of wooden houses, easily known as those of the fishermen, from the various apparatus and articles of dress which are depending about, and from the "ancient and fish-like smell" which prevails in their neighbourhood. No less than thirteen hundred sailors find employment in and about the basin ; and there are close on five hundred boats of all kinds, a number of them being steam trawlers. The value of the fishery of which Arcachon is the head-quarters is estimated at over 1,500,000f., exclusive of the revenue derived from the oyster-beds. In the basin there are lots of fish of all kinds, both round and flat, capital soles in tolerable abundance, and very excellent mullet, both red and grey ; there are also occasional takes of sardines, which fish is locally known as the royan. The steamboats referred to go out into the Bay of Biscay to trawl, and carry also an immense net, which the men call a trammel ; it is cumbrous and heavy, and can only be drawn in by using the steam-engine of the ship. Great "takes" of mullet are occasionally got at Arcachon by watching and hemming in shoals which get lost in the numerous creeks that indent the shores of the basin. There is a ready market for all the fish that can be taken in Bordeaux, Poitiers, Tours, and neighbourhood, and it is because of this market that there has grown up at Arcachon such a considerable fishing industry. The most picturesque part of the fishing industry carried on at Arcachon is the night fishery. Whenever it becomes dark enough the fishermen go out with the leister, and fish, as they used to do long ago in the Tweed, from an illuminated boat. Three men are required for each boat for the night fishing, two to row and one to hurl the spear. As many as a dozen boats may be seen nightly at this work, each with a brilliant flame of light flashing from its prow; the fish speared are mullet, and they are mostly used for local consumption, the accession of visitors in summer rendering a large supply of fish necessary. There are illuminated fisheries in some other parts of France, but that of Arcachon is the most prominent. The yield of fish, however, is not large-indeed it could not be, when it is taken into account that each individual fish has to be speared. Some more economical mode of night fishing, if night fishing be necessary, ought to be invented. A few scores of mullet are a poor reward for three or four hours' labour of three men. The perpetual industry carried on by the coast people on the French foreshores is quite a sight, although it is fish commerce of a humble and primitive kind. Even the little children contrive to make money by building fish-ponds, or erecting trenches, in which to gather salt, or in some other little industry incidental to sea-shore life. One occasionally encounters some abject creature groping about the rocks to obtain the wherewithal to sustain existence. To these people all is fish that comes to hand; no creature, however slimy, that creeps about is allowed to escape, so long as it can be disguised by cookery into any kind of food for human beings. Some of the people have old rickety boats patched up with still older pieces of wood or leather, sails mended here and there, till it is difficult to distinguish the original portion from those that have been added to it; nets torn and darned till they are scarce able to hold a fish; and yet that boat and that crippled machinery are the stock in trade of perhaps two or three generations of a framily, and the concern may have been founded half a century ago by the grandfather, who now sees around him a legion of hungry gamins that it would take a fleet of boats to keep in food and raiment. The moment the tide flows back, the foreshore is at once overrun with an army of hungry people, who are eager to clutch whatever fishy debris the receding water may have left; the little pools are eagerly, nay hungrily, explored, and their contents grabbed with that anxiety which pertains only to poverty. On some parts of the French coasts, and it is proper to mention this, the fishery is not of importance, although fish are plentiful enough. At Cancale, for instance, the fishermen have imposed on themselves the restriction of only fishing twice a week. In Brittany, at some of the fishing places, the people seem very poor and miserable, and their boats look to be almost valueless, reminding one of the state of matters at Fittie in the outskirts of Aberdeen. At the isle of Croix, however, there is to be found a tolerably well-off maritime and fishing community; at this place, where the men take to the sea at an early age, there are about one hundred and thirty fishing boats of from twenty to thirty tons each, of which the people - i.e. the practical fishermen-are themselves the owners. At the Sands of Olonne there is a most extensive sardine-fishery-the capture of sprats, young herrings, and young pilchards, for curing as sardines, yielding a considerable share of wealth, as a large number of boats follow this branch of business all the year round. Experiments in artificial breeding are constantly being made both with white fish and crustaceans, and sanguine hope,-, are entertained that in a short time a plentiful supply of all kinds of shell and white fish will reward the speculators, and as regards those parts of the French coast which are at present destitute of the power of conveyance, the apparition of a few locomotives will no doubt work wonders in instigating a hearty fishing enterprise. In fact the industry of the French as regards the fisheries has become of late years quite wonderful, and there is evidently more in their eager pursuit of sea wealth than all at once meets the eye. No finer naval men need be wished for any country than those that are to be found in the French fishing luggers, and there can be no doubt but that they are being trained with a view to the more perfect manning of the French navy. At any rate the French people (? government) have discovered the art of growing sailors, and doubtless they will make the most of it, being able apparently to grow them at a greatly cheaper rate than we can do. The commercial system established in France for bringing the produce of the sea into the market is of a highly elaborate and intricate character. The direct consequence of this system is, that the price of fish goes on increasing from its first removal from the shore until it reaches the market. This fact cannot be better illustrated than by tracing the fish from the moment they are landed oil the quay by the fishermen, through various intermediate transactions, until they reach the hands of the fishmonger of Paris. The first agent into whose hands they come is the ecoreur. The ecoreur is usually a qualified man appointed by the owners of the vessels, the municipality, or by an association termed the Societe d'Ecorage. He performs the functions of a wholesale agent between the fishermen and the public. He is ready to take the fish out of the fisherman's hands as soon as they are landed. He buys the fish from the fisherman, and pays him at once, deducting a percentage for his own services. This percentage is sometimes 5, 4, or even as low as 3 1/2 per cent. He undertakes the whole risk of selling the fish, and suffers any loss that may be incurred by bad debts or bad sale, for which he can make no claim whatever upon the owner of the boat. The system of ecorage is universally adopted, as the fisherman prefers ready money with a deduction of 5 per cent rather than trouble himself with any repayment or run the risk of bad debts. Passing from the ecoreur we come to the mareyeur - that is, the merchant who buys the fish from the wholesale agent. He provides baskets to hold the fish, packs them, and despatches them by railway. He pays the carriage, the towndues or duties, and the fees to the market-crier. Should the fish not keep, and arrive in Paris in bad condition, and be complained of by the police, he sustains the loss. As regards the transport arrangements, the fish are usually forwarded by the fast trains, and the rates are invariable, whatever may be the quality of the fish. Thus, turbot and salmon are carried at the same rate as monk fish, oysters, and crabs. On the northern lines the rate is 37 cents per ton per kilometre ; upon the Dieppe and Nantes lines, 25 or 26 cents ; which gives 85 or 96 francs as the carriage of a ton of fish despatched from the principal ports of the north-such as St. Valery-sur-Somme, Boulogne, Calais, and Dunkerque - and 130 francs per ton on fish despatched from Nantes. The fish, on their arrival in Paris, are subjected to a duty. For the collection of this duty the fish are divided into two classes - viz, fine fresh fish and ordinary fresh fish. The fine fish-which class includes salmon, trout, turbot, sturgeon, tunny, brill, shad, mullet, roach, sole, lobster, shrimp, and oyster-pay a duty of 10 per cent of the market value. The duty upon the common fresh fish is 5 per cent. This duty is paid after the sale, and is then of course duly entered in the official register. All fish sent to Paris are sold through the agency of auctioneers (facteurs a la criee) appointed by the town, who receive a commission of 2 or 3 per cent. The auctioneer either sells to the fishmonger or to the consumer. It will be seen from the above statement that between the landing of the fish by the fisherman and the purchase of it by the salesman at Paris there is added to the price paid to the fisherman 5 per cent for the ecorage; 90, 100, or 130 francs per ton for carriage ; 10 or 5 per cent, with a double tithe of war, for town-dues ; and 3 per cent taken by the auctioneer-or, altogether, 18 or 13 per cent, besides the war -tithe and the cost of transport. This is an estimate of the indispensable expenses only, and does not include a number of items-such as the profit which the mareyeur ought to make, the cost of the baskets, carriage from the market to the railway, and from the custom-house to the market in Paris ; besides presuming that the merchant who buys in the market is the consumer, which is seldom the case. The capture and cure of the sardine is a great business in France, and especially at Concarneau, where as many as 13,000 men aid in the fishery. It is not easy to obtain accurate statistics of the business done in sardines. In the first place there is a large quantity sold fresh-that is, packed in dry salt, in little baskets made of rushes, and sent wherever there is a mode of outlet, Then there is an enormous number sold in those familiar tins. It is said that besides the quantity exported, which is large, there are as many as 4,000,000 boxes cured in oil and prepared for the home market ; then, besides these, a large number are sold in barrels, and also pressed in barrels. It is an interesting sight to witness the arrival of the boats, and to see the rush to the curing establishments of the men, women, and children interested in the sales. How their sabots do clatter as they prance over the stones ! The curers just buy from day to day what sardines they require, and no more ; generally speaking, they do not, as in the Scottish herring fishery, make contracts with boats, and only one or two firms have boats of their own. When the curers are in want of a supply of fish they put up a flag at their curing establishment, and the fishermen hurry to supply them, the price varying from day to day according as the fishery has been abundant or the reverse. As soon as the boats arrive the fish are put in train for the cure, by being gutted, beheaded, sorted into sizes, and washed in sea water, chiefly by women, who can earn from 12 francs to 20 francs a week at these curing establishments. The cure is begun by drying the fish on nets or willows, generally in the open air, but sometimes, from stress of weather it must be done under cover. After being dried they are ready for the process of the pan, which is kept over a furnace, and is filled with boiling oil. Into the cauldron the fish are plunged, two rows deep, arranged on wire gratings. In this pan of oil (the very finest olive oil) they remain for a brief period, till, in the judgment of the cook, they are done sufficiently. Then they are placed to drip, the drippings of oil being, of course, carefully collected ; after which they are packed by women and girls into the nice little clean boxes in which they are sold. Again they are allowed to drip by the boxes being sloped ; then each box, by means of a tap, is filled carefully up to its lip with pure olive oil, when it is ready for the next operation, which is the soldering on of the lids, or, as it may be called, the hermetical sealing up of the box, a most particular part of the process, at which the men can earn very large wages, with this drawback, that they have to buy all the fish that are spoilt. After the soldering has been accomplished the boxes have to be boiled in a steam chest. Those that do not bulge out after the boiling are condemned as " dead ;" for when the process is thoroughly gone through the perfection of the cure is known by the bulging out of the boxes, which are of various sizes, according to the purpose for which they are designed. There are boxes of 6 lbs. weight and 21 lbs. weight, as also half and quarter boxes, with from 24 to 12 fish in them, according to size. Little kegs are also filled with sardines cured as anchovies. The finishing process of the sardine cure is to stamp the boxes and affix the thin brass labels which are always found upon them. There are little incidental industries connected with the cure which may be noticed. The debris is sold for agricultural purposes, as is the case at home here, where the curers get a few pounds annually for their offal ; then a large quantity of oil is exuded from the sprat during the process of the cure, and on the total fishery this oil is of considerable value. The " dead " fish, as we have said, are sold to the men, but the success of the cure is usually so great that the "dead" form but a very small percentage of the total number of boxes submitted to the test. piscatorial bourse we can see in the early morning the produce of our most distant seas brought to our greatest seat of population, sure of finding a ready and a profitable market. 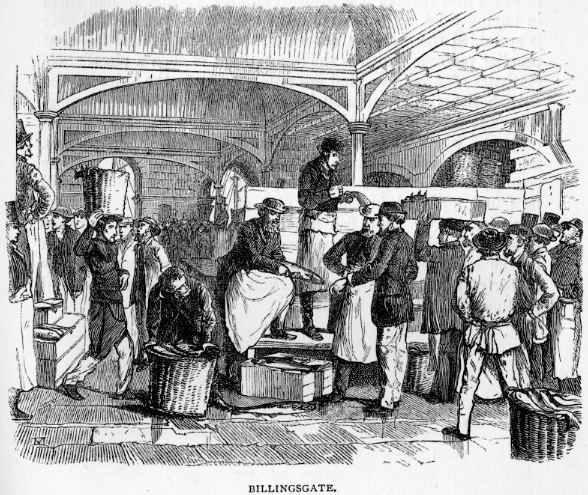 The aldermanic turbot, the tempting sole, the gigantic codfish, the valuable salmon, the cheap sprat, and the universal herring, are all to be found during their different seasons in great plenty at Billingsgate; and in the lower depths of the market buildings countless quantities of shell-fish of all kinds, stored in immense tubs, may be seen; while away in the adjacent lanes there are to be found gigantic boilers erected for the purpose of crab and lobster boiling. Some of the shops in the neighbourhood have always on hand large stocks of all kinds of dried fish, which are carried away in great waggons to the railway stations for country distribution. About four o’clock on a summer morning this grand piscatorial mart may be seen in its full excitement—the auctioneers bawling, the porters rushing madly about, the hawkers also rushing madly about seeking persons to join them in buying a lot, so as to divide their speculations; and all over is sprinkled the dripping sea-water, and all around we feel that peculiar perfume which is the concomitant of such a place. No statistics of a reliable kind are published as to the value of the British fisheries. An annual account of the Scottish herring-fishery is taken by commissioners and officers appointed for that purpose; which, along with a yearly report of the Irish fisheries, are the only reliable annual documents on the subject that we possess, and the latest official report of the commissioners will be found analysed in another part of this volume. For any statistics of our white-fish fisheries we are compelled to resort to second-hand sources of information; and, as is likely enough in the circumstances, we do not, after all, get our curiosity properly gratified on these important topics—the progress and produce of the British fisheries.